This historic architect designed and built lake front dwelling is a truly unique destination, minutes north of the Coffs Harbour CBD. Architect, Doug Ranson, designed and built the gallery amongst soaring old growth eucalypts using local native timbers, creating all of its stunning, unique features including the pitched cathedral ceilings. The accommodation is sun drenched, spacious and provides 2 truly unique bedrooms. The master suite enables star gazing and tree top nocturnal wild life viewing directly from your pillow. At sunrise enjoy a coffee on your own private jetty over looking your own private lake. Then attempt to count the incredible variety of wildlife that surround you. Once awake, walk the beach then enjoy breakfast at one of the local cafes. 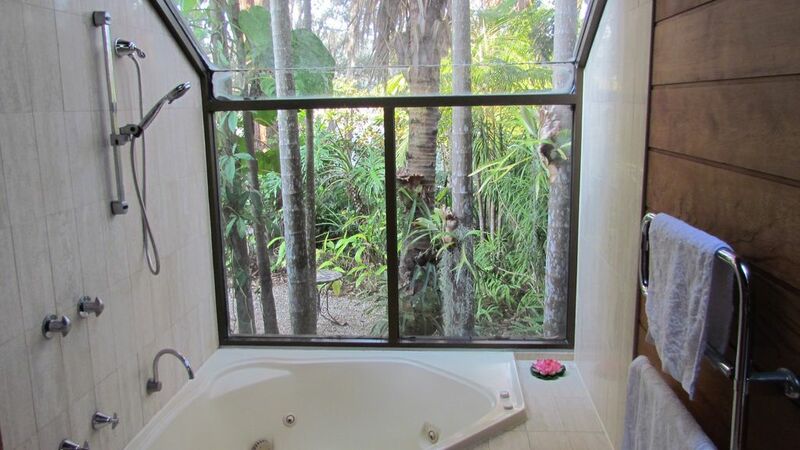 Have a swim, then a relaxing spa whilst gazing into the adjacent rainforest. For lunch maybe, entertain and have a BBQ on the alfresco deck over looking your tropical garden and serene lake Russell. You'll sleep all afternoon! Come evening, entertainment could include the local restaurants or a meal cooked in your very own extensive sunken entertainers kitchen. But, remember too, the local provides a free shuttle bus to the wee hours. This property is perfect for maximum of 6 people. I give five stars rating for everything except there’s only 1 toilet and shower. Although open view in the shower to the nature is a good experience, an option of a screen will be good. I strongly recommend a minimum 2 nights stay. A visit to nearby “Look At Me Now Headlands” which is 10 minutes drive should not be missed. And for a full day tour Dorrigo Rainforest Walk and Dengar Fall is a good option. Do bring extra change of clothing, a dip in the water Fall after the Rainforest walks is perfect. Love the situation among the trees and bush and next to the lake. Roomy and comfy home away from home!